I’m loving this app but there’s much improvements to be made. The media insert still not working after the latest update on Wednesday. Turning pages is a real pain, you cannot just swipe for next page, instead you have to hit that top left or right page corner, now this is lame. Some of the lag problem been tackled in the latest update but still traces of screen lock up here and there. For us in Asia, the worst part is that the app does not support Chinese nor Japanese input , real bummer (well, emoticons work at least, LOL). Is it that bad? well, the app has real potential but I suspect it require much horsepower to get this app running. On the new iPad, it seems ok, more laggy on the iPad 2, for the iPad 1, well….don’t even think about it. I hope the developers can work out the problem fast cause this app is getting a lot of attention for its innovative interface but at the same time, bad vibes for its problems. Apart from the new processor, new Retina Display, additional battery capacity, improved camera, Siri Dictation has to be one of the great new features of the new iPad. Check out what it can do in this video, totally awesome. Awesome review on the new iPad from Macworld, everything you wanna know. The new models, DEV-3 and DEV-5, are ideal for nature/bird watching, they can record Full HD video with stereo sound at the touch of a button, and even add a 3D mode that records scenes as thrilling stereoscopic video footage for playback on most 3D HDTVs. The new DEV-3 and DEV-5 digital recordable binoculars from Sony will be available in November 2011 for about $1400 and $2000. Apart from the video review, you can find a write-up over at photoclubalpha. Press Release after the jump. DODOcase just launched a whole line of DODOcase for iPad 2 but I’m interested in is the back cover on the iPad 2 they have, called the BOOKback, which protects the backside of the iPad 2 as well as the iPhone 4. Take a look at the above video from the guys over at the iphoneblog. It is pretty much the same as the GelaSkins I reviewed a while ago, Very easy to apply and I bet those are 3M adhesive as well, meaning they can be taken off and reapply fairly easily. Judging by the looks of the BOOKback in the video, it sure looks neat. Pricing on the BOOKback, US$19.95 for the iPad 2 and US$8.95 for the iPhone 4. For those who write quite often, no matter whether you’re a student, housewife, screenwriter, poet or author, a good writing tool is definitely something that you should not overlook. 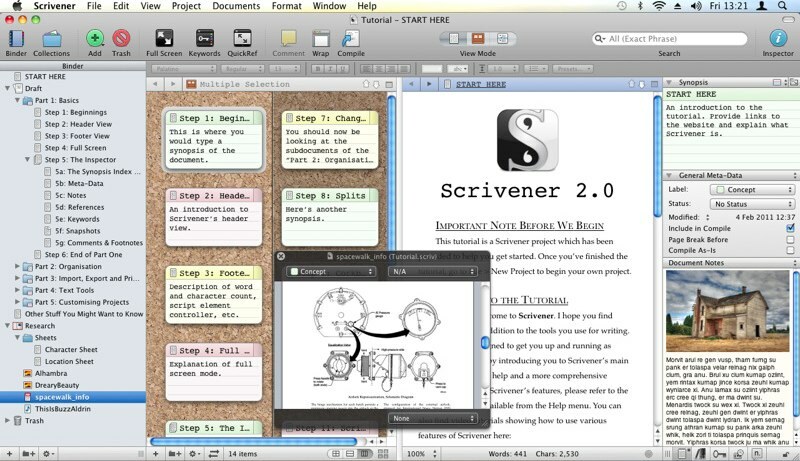 Be it a school essay, a thesis paper, a poem, a report, a script, a book or as minute as a household recipe, this application Scrivener just might be the perfect tool. According to Scrivener, “Scrivener puts everything you need for structuring, writing and editing long documents at your fingertips. On the left of the window, the “binder” allows you to navigate between the different parts of your manuscript, your notes, and research materials, with ease. Break your text into pieces as small or large as you want – so you can forget wrestling with one long document. Restructuring your draft is as simple as drag and drop. Select a single document to edit a section of your manuscript in isolation, or use “Scrivenings” mode to work on multiple sections as though they were one: Scrivener makes it easy to switch between focussing on the details and stepping back to get a wider view of your composition.